Unfortunately the "Free Jug of Driveway Heat Ice Melt" offer is no longer available. As a premium product in the marketplace, Prestone Driveway Heat is a concentrated Calcium Chloride pellet ice melt. Being able to melt snow and ice upon impact makes Prestone Driveway Heat the fastest and most efficient ice melter in the industry. Get a Prestone 9-1/2 Lb. 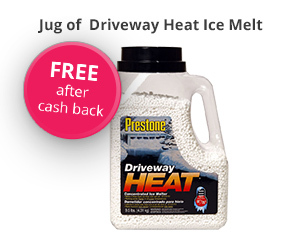 Jug Driveway Heat Ice Melt absolutely free. Simply, join TopCashBack and sign up for a free account. Once signed up, you'll be directed to the Ice Melt Freebie offer page. Click ‘Get Offer Now' and it'll take you to Lowe's. Add 1 Prestone 9.5 Lbs. Jug Driveway Heat Ice Melt to your cart and checkout. This is a free in-store pick up offer. Within 14 days, your account will be credited with your free $9.97 in cash back. Offer runs through March 31, 2019 or while quantities last.